First off, I have to apologize for some of the picture qualities this month -- we had a power cut as I was taking all my photos, and since it was also recycling bin collection day, I had to pop everything outside so I didn't have a massive pile for two more weeks. The lighting is a bit dim, but you can hopefully still see each product clearly! Most of these were not full size, and some were just single use sachets, but still - 30 products! That is almost 20 more than February's haul! In terms of waste, this was not a great month, as the majority did come in plastic packaging. I was really surprised that the Inika and Green People items were not recyclable (or at least they did not have any marking to indicate that they were! ), and really disappointed in Imperial Candles' MeltyBox for using non-recyclable casings for their wax melts. If I had not already cancelled my subscription, I would have at this point as it is ridiculous to use something that is going straight into a landfill! All in all, 11 of the 30 empties were non-recyclable (plus the plastic wrap around the NEOM and some of the sticker labels), but I have decided to reuse the wax melt cases and the Balm Balm pot so at least those four pieces won't end up polluting the world. 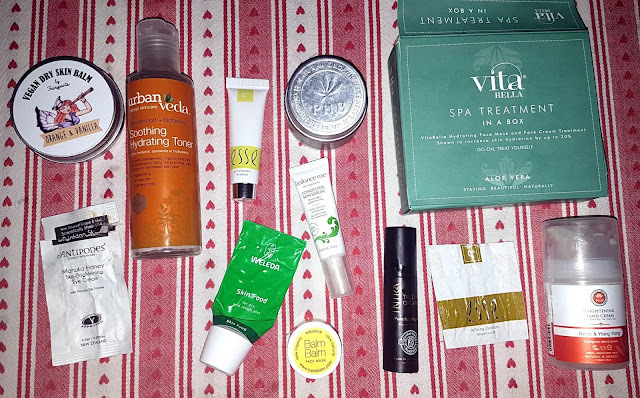 In terms of the products themselves, there were a few that I really loved, one I really disliked, and quite a lot that were pretty good. So let me get down to it! Antipodes Manuka Honey Eye Cream: This skin-brightening eye cream was surprisingly lovely - I say surprisingly because it looks and feels really rich and heavy, but it did not congest the delicate skin around my eyes which is something that happens with a lot of cream-consistency eye products. I brought this with me to Belfast, but it lasted me longer than the mini-break - nearly two weeks actually (but I don't use a lot)! I have to say I did notice a difference after about a week of using this, and am considering buying the full size when my PHB eye gel is finished. Balm Balm Hibiscus Face Mask: I have used several of these sample pots now (I reuse the packaging to make my own lip balms), though I had not really used it this year. It is activated by water, but I use a bit of hydrosol instead, and it has a consistency similar to most clay masks. The product works as both a gentle scrub (which I mentioned in my Exfoliation Favourites post!) and a thorough cleanse for the skin. Definitely will buy the full size as it is really affordable and works great, but first I have to finish some of my other clay masks! Urban Veda Soothing Hydrating Toner: I wasn't super impressed by this toner, but I didn't hate it either. It left a weird feeling after use, almost like a sticky residue, but that sensation disappeared after about five minutes or so. I did find it a little strong for my skin, but it did not need diluting like some of the other facial tonics I have been using recently (which I will explain in another post possibly..). It is definitely a good price, it smells really nice, and the ingredients are not too bad, but I personally didn't find it to do too much for me, so I will not be repurchasing. Balance Me Congested Skin Serum: I won't say too much about this, as I have posted about it at least three times before (see NY1, NY2, Jan). I love this, and have two more samples to use up plus a full size bottle. I use this twice a day, every day, and it has done wonders for my skin! I get hormonal spots from my BC, and this really helps keep them at bay. PHB: The Neroli & Ylang Ylang hand cream is seriously divine, and has quickly become a favourite of mine. It is rich without being sticky or oily, and sinks in really well. I found it really moisturizing and it really helped my hands out this winter. I can't say it necessarily 'brightened' my skin, but it definitely smells lovely and helped protect my hands from the harsh, drying winds. I have already bought two more bottles! I really liked the Gentle Moisturizer as well, and even though it is pretty thick (it has shea as a main ingredient), it did not clog my pores at all. It made my skin feel silky smooth, and really soothed my sore skin. It is designed for more sensitive skin, and it seriously lasted ages. I would definitely repurchase in the future (I first have to use up the 10 bottle of moisturizer I have waiting in my drawer though!). FairyPants Orange & Vanilla Dry Skin Balm: I loved this little pot, and found it worked great. The balm soaks in so fast, and it left my legs feeling really soft and hydrated. The smell is pleasant, but not overpowering, and it didn't make me sneeze so it's a plus from my allergy-prone nose. Since it is so affordable and lasts ages, I think I will definitely be buying this again at some point - maybe for the summer! Esse: Like the Balanced Me serum, I have posted about these cleansers several times before (Jan, Jan1), so I won't say too much other than I love them and will be buying the full size of both when my sample sachets run out. I use the gel cleanser when my skin is clear and balanced, and the refining cleanser when my T-zone needs a bit more TLC. 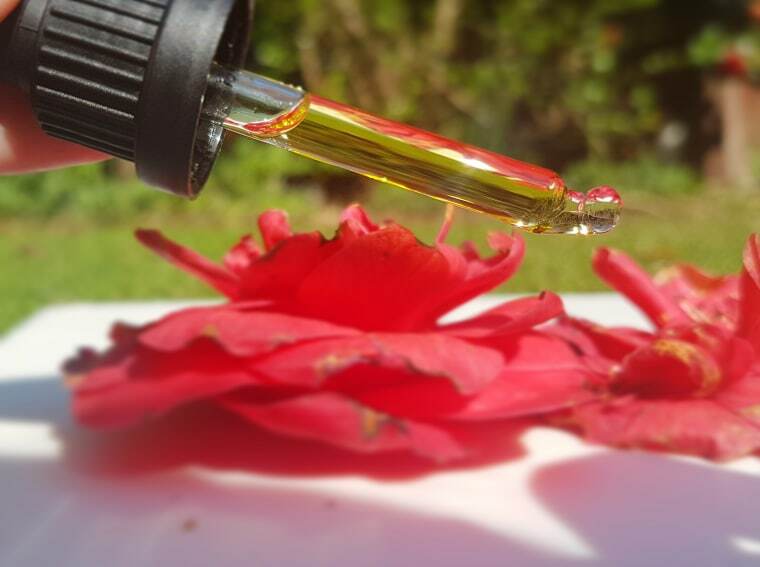 Inika Rosehip Oil: I mentioned this face oil in my Face Oil Showdown a few months back, and now that I have finished it I stick to my initial reaction. It is a nice face oil, and it is nourishing and smells great, but I think it is more suited to someone with dry or aging skin. It did not sink in my face very quickly, so I ended up using it on my legs and arms instead as I don't like the feeling of a product just sitting. 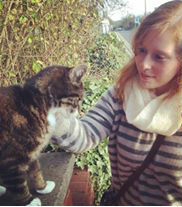 For this purpose, I loved it. I have so many face oils to use up as it is, so I won't be rebuying, but it is a lovely product. VitaBella: Since I did a whole post on this kit recently, I won't say too much other than that I would definitely recommend this to anyone who needs a hydration boost, wants a great anti-aging treatment, or just wants a bit of at-home spa fun. I won't be buying another kit anytime soon as I have so much skincare to get through, but would definitely be happy to receive this again. Friendly Detox Bar: I absolutely loved this soap, and I think that is the first time I can honestly say that about a body soap bar. It does still leave that 'soap' feeling on the skin, but I didn't mind it so much as I could also feel the nourishing ingredients working as well. My arms and lower back really benefited from this, and I have already bought another bar -- it is ridiculously cheap, so I think I will have this as a new staple for the shower. The Salt Parlour Jasmine & Macha Green Tea "Repair" Scrub: I thought I had posted about the Lime version of this, but looking back it seems I must have recycled the container without including it in my empties! This is probably the best salt scrub I have used, as it is the perfect mix of 'scrubby' and moisturizing. I get a great exfoliation treatment without irritating my skin or stripping it of the natural oils, plus you only need a little bit of the product. I love this brand, and have ended up buying four more pots of this over the weekend so I can try out the rest of the range. Caudalie: I have said it so many times now, I sound like a broken record, but if only Caudalie were ACTUALLY cruelty free, I would so get behind them. 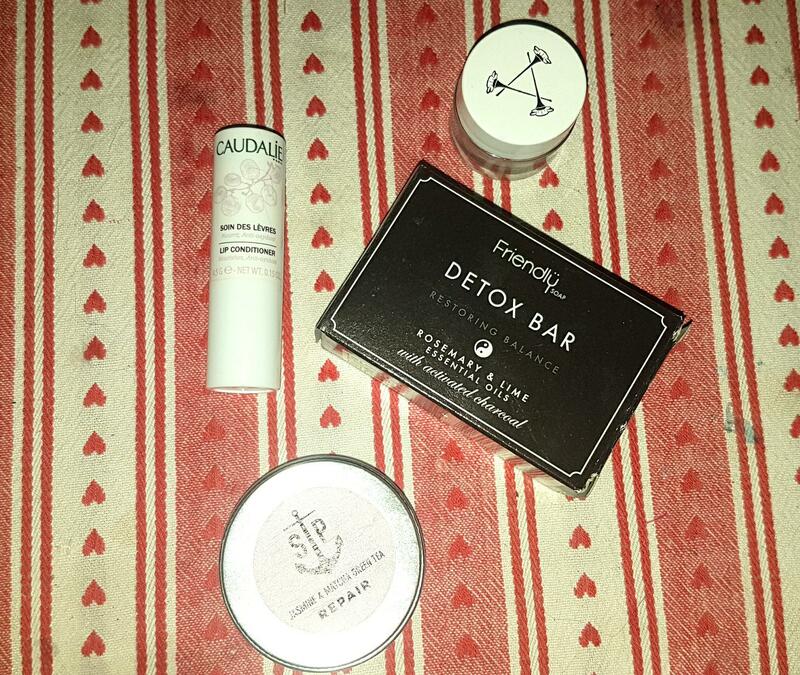 I have not bought anything from them since finding out about their status (and in fact had not actually bought anything from them previously other than a can of the grape water - it has all come from beauty boxes! ), and I am finally on the last few items to use up from them. I hate to say it, but this lip balm is genuinely lovely. It smells great and feels even better. Why can't they just get their acts together in terms of their ethics?? Aromatherapy Associates Moisturizing Lip Balm: I have to be honest, this is a weird one. It smells pretty bland, and is incredibly thick, almost more suitable as a hand balm than for the lips. That being said, it did a decent job and it stayed on my lips much longer than other products I have tried. For the price, I am not sure it is entirely worth it, but it is by no means bad. I also have found out recently that AA sell in China, so are not actually cruelty free, so this is a brand I will no longer be buying from. Imperial Candles: I do like IC candles and melts, as they do not make me sneeze, have great range of scents, and come with jewelry that does not irritate my sensitive skin (I am allergic to a few metals so can't wear a lot of stuff found on the high street). They are a bit pricey, and their shipping costs are a bit infuriating (although they have gotten better over the last year I think), but they last for a long time. I bought the full size candle over a year ago, and it just finished about a week ago. Fresh Cut Roses was really nice, especially in the spring and summer, and I would love to find another candle like this. The melts were all okay, but a little on the sweet side for me. I think my time buying from IC is at and end though, as I am trying to buy from smaller businesses and naturally sourced/fresh ingredients. Also, in terms of the ethical angle of their jewelry, they are not very clear on where it comes from, so I feel a little uneasy about that. Neom: An odd one, and I am still not sure what the real purpose was. I got this as a freebie in a Latest in Beauty box I think, and found it in my cupboard again recently. The instructions say to just break the capsule in your hand and breathe in. Seems a bit of a waste and an odd product - why not a spray or a body oil? The scent was really nice, but I won't be buying this. Organdle: If you haven't checked out this brand yet, do so! The products are so good, smell amazing, are all natural, and are all hand made. I mentioned this in my Feb Favs, and it is still one of my best finds this year I think. 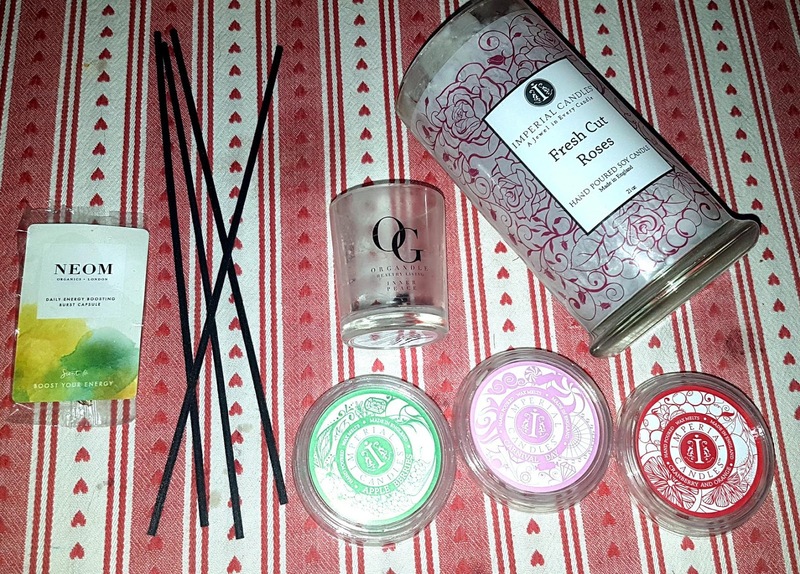 I got a set of four of the travel sized candles, and I love them all. This size lasts about 16 hours, and it burned really evenly and didn't make that annoying shell or cone where the wax doesn't entirely melt. Will be getting a full size in the future -- I just have to decide which scent! Sass & Boho: The sticks are from an oil diffuser in our bathroom, and while it is a nice little product, I probably won't get a refill for it when it is finished. I prefer a spray or candle I think, or our plug in diffuser from Tisserand that is in the bedroom. We have Pink Pepper & Saffron which does smell really nice, but remembering to turn the sticks every week has been a bit of a struggle. It is genuinely a great product, but not for those who have a poor memory! 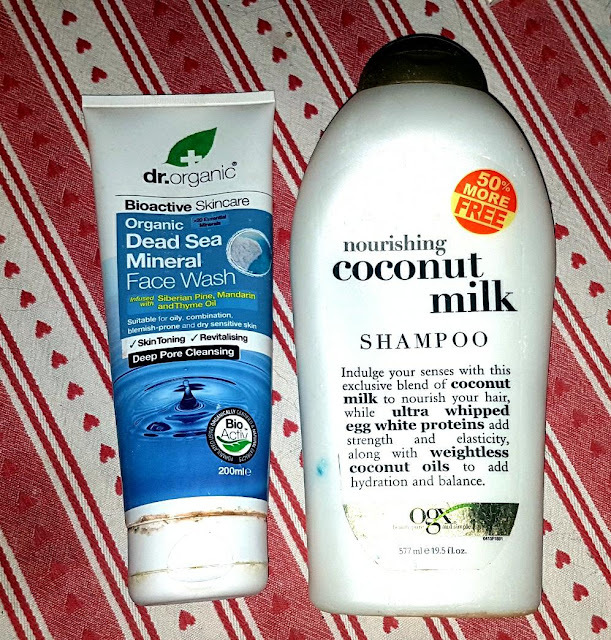 These are my two least favourite products I finished up this month - Dr. Organic Dead Sea Mineral Face Wash and OGX Coconut Milk Shampoo. I singled these out for the same reason actually, and that is issues with green washing. I actually bought the shampoo a few years ago when I was visiting my family back in the US. It was (and still is for the most part) really difficult to find natural or at least sulphate-free options for hair care, so I opted for this bottle from OGX. While it is not natural *at all* it is free from harsh sulphates. I used this as a clarifying shampoo once a week until it finally was gone. It isn't necessarily poor in performance, but I prefer to use as few ingredients as possible on my head and hair. Plus, I hate how misleading it is - it makes it sound like this great product free from nasties and synthetics, while in all actuality it is not that at all. Until a few years ago they actually got away with calling themselves Organix, but they were eventually pushed to change the label due to there not being any organic ingredients included. The Dr Organics was effective and did help with balancing my skin initially, but it ended up being too harsh and dried my skin out terribly. Whenever I got out of the shower my face felt itchy (partially from our hard water, but mostly from this product). My issue with this is similar to the OGX and I mentioned this last month as well -- the amount of organic ingredients is very minimal and I find the label very misleading to consumers. This is a good starting point for those switching their products, and is affordable, but if you are looking for something that is properly organic, I would suggest looking elsewhere. I don't think I could pick just one or two favourites for this month, as I did genuinely like so many of the items I used up. Organdle, The Salt Parlour, Friendly, and Antipodes might be the standouts this month, along with some of my past picks like Esse, Balance Me, and PHB. However, the rest were all really great too, and the only products I really took issue with are the ones I have flagged up. Have you tried out any of these products? Which did you love or hate - let me know in the comments below! 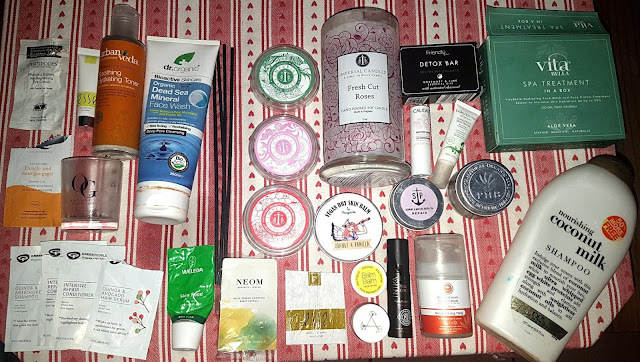 Or, better yet, show me what empties you ended up with in March! And remember, if you want to buy any of these products (or anything else in your wishlist) from Love Lula before the 4th of April, you can use code GIVEME15 to get 15% off orders over £70, or GIVEME10 for 10% off orders over £40. Wow, that's a lot of products - even if they weren't full size :) I have to admit I don't use many of these brands except Weleda, which I love. What a lot of products! I'm ashamed to say I've not tried any of them you have featured. I do like green people products but never tried there hair products. Wow, this is such a comprehensive directory of many great products! I’m so impressed with the time you’ve put into this project. I’m most interested in trying the FairyPants Orange & Vanilla Dry Skin Balm. What a lot of products. It’s good to read and learn about new products that I have not come across through posts like these. I will check some of these out for sure. Oh wow there is a lot of empties there! It’s quite worrying so many companies are still not using recycleable packaging. I love that you find your own ways to re-use them though. It is worrying :( I've already found a new use for the Balm Balm pot though! I've melted a broken lippy down and it's the perfect size for it! So many amazing products! I have heard a lot about Urban Veeda! Might look into them and see what other products they do!